Step 1 Heat a skillet over high heat and add the oil. Wait until a wisp of white smoke appears, then add the garlic and cook, stirring, until light brown, about 20 seconds. Step 2 Stir in the edamame, snow peas and cabbage and reduce the heat to medium. Add the water or chicken stock and cook, covered, for 30 seconds. Step 3Stir in the oyster sauce and soy sauce, making sure to coat all the vegetables well, and cook for about 30 seconds. Once the vegetables are cooked through but still crisp, 4 to 5 minutes, add the white pepper. Taste and adjust the seasonings if necessary. Serve it with rice. In Recipes-list.com we have selected the most viewed recipes from category - Main courses Vegetarian . Enjoy the best recipes specially selected for you! 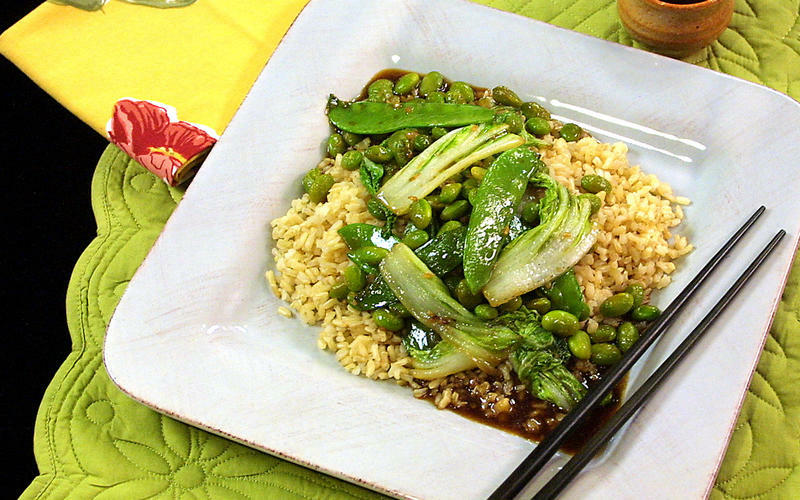 Edamame stir-fry is the right choice that will satisfy all your claims.